Zynga has given millions of Facebook gamers free toys to play with. Now it's time to spread the love. 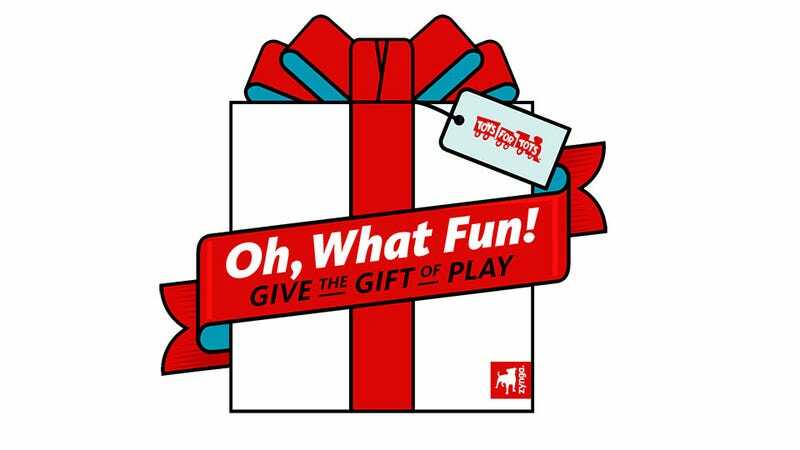 Today Zynga launches "Oh, What Fun! ", a digital charity drive for Toys for Tots, spread across seven popular social games. The Marine Toys for Tots Foundation has been bringing Christmas presents to less fortunate children for 65 years. I attribute a great deal of the program's success to its combining the joys of shopping at Toys R Us with the warm fuzzy feeling of giving. Maybe that's just me. Either way, it's my favorite charity. Zynga's "Oh, What Fun" initiative combines the infectious (some might say addictive) joy of spending real money for in-game items with those warm fuzzies. I think this is a great idea. Instead of feeling guilty that you just spent cash on a virtual sheep riding a virtual horse in FarmVille, you can feel good about yourself, knowing that 100 percent of the proceeds went towards introducing some poor child to Transformers or My Little Pony. "Zynga and Toys for Tots share a common belief in the positive power of play and we're proud to invite our players to join us in supporting Toys for Tots' mission to deliver hope through the gift of toys," said Ken Weber, Executive Director, Zynga.org. "Together with our players, we're showing that social games really do enrich people's lives." "Oh, What Fun!" covers CityVille, CastleVille, Words With Friends, FrontierVille, Bubble Safari, Draw Something and FarmVille, each game offering special in-game goodies or the ability to send text message donations. You can hit up the Zynga blog for a full list and availability schedule of the charity tie-ins, or you can just behold the glory of the $1 FarmVille Cheer-Ewe-Up Horse—a sheep riding a horse dressed up for the holidays.